As an independent author, my benchmarks for success are quite different than they are for traditionally published writers, particularly those authors with an established career. Some days, simply selling a single copy of one of my books is great news. So imagine my delight when I look at my sales over the past week and see that I’m having my best run since I began this endeavor last September. Books have been moving steadily, and one particular day I hit an all-time one-day sales peak. It’s a huge ego boost, and it encourages me to keep going. 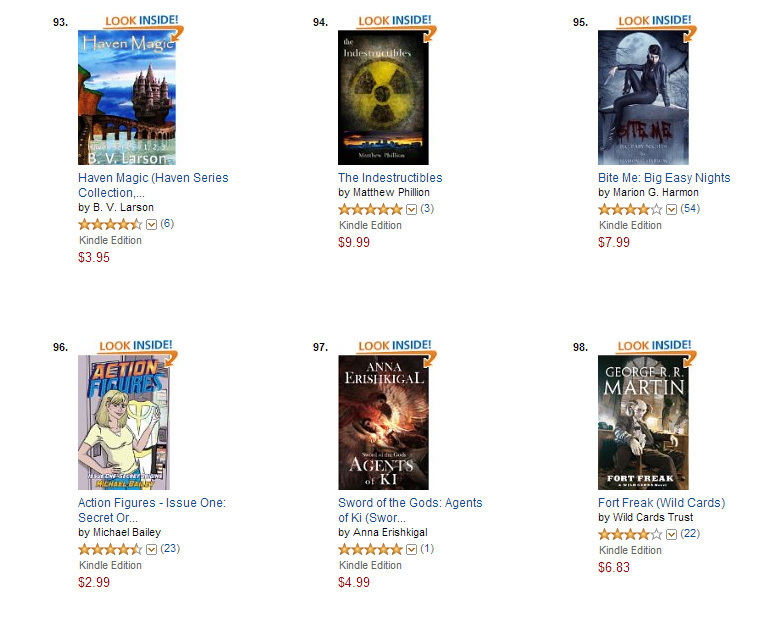 That’s my book in the lower left corner, sitting at the #96 position…two spots above something with George R.R. Martins’ name splashed on the cover. While I’m not going to start slapping the boast of “best-selling author” on my stuff, because that is, even by indie author standards, a HUGE stretch, I’m absolutely going to bask in the fact that book one is moving well enough to appear anywhere on any best-seller chart.